Tasty, jazzy, and just the right amount of lazy – New Orleans has perfected brunch into a fine art. One of the best things about spending a weekend getaway in New Orleans is indulging in a full spectrum of the city’s dishes and flavors. Great food has been the city’s bread and butter since the beginning. And with Bienville House’s unbeatable location in the heart of the Vieux Carré, you can book your stay just steps from the best places for brunch in the French Quarter. With so many must-try dining options, you’ll want a brunch-time itinerary for tasting New Orleans’ best. Read on for our favorite Brunch Spots in the French Quarter! 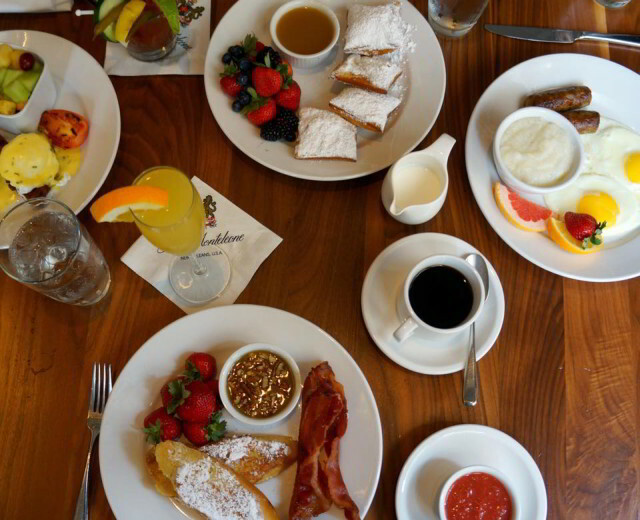 Indulge in breakfast at Criollo Restaurant, located inside our sister property, Hotel Monteleone. The Scoop: Breakfast is served 7 days a week from 6:30 a.m.- 11:00 a.m., complete with a daily eggs Benedict special. Criollo is located right next to to the famous Carousel Bar inside Hotel Monteleone, where many literary figures famously stayed. You’ll want to try a Death In The Afternoon, Ernest Hemingway’s breakfast of choice – it’s made with Lucid Absinthe & Prosecco and will definitely kickstart your day. The Scoop: Located on Jackson Square, Stanley offers breakfast and brunch all day long. It’s an old-fashioned diner that gives you plenty of options for your mid-morning appetite, from eggs and bacon to sandwiches and homemade ice cream desserts. In particular, the Bananas Foster French Toast is worth a try – Stanley is famous for this breakfast classic with a New Orleans twist, featuring battered French bread, sliced bananas, vanilla bean ice cream, and toasted walnuts with foster sauce. The Scoop: The Ruby Slipper is a local’s favorite brunch spot, with multiple locations scattered throughout the city. This location on the edge of the French Quarter offers a casual diner setting that’s big on flavor. Order New Orleans-inspired specials like the Eggs Cochon (slow-cooked, apple-braised pork debris served over an open-faced house-made buttermilk biscuit, topped with two poached eggs, and finished with hollandaise) or opt for The Costa Rican (slow-cooked black beans & rice over a warm tomato salsa, accompanied by two eggs, crispy plantains & avocado). The Scoop: Eat New Orleans is a favorite dining spot for French Quarter locals, and for good reason. Their Saturday and Sunday brunch menu features starters like Banana Fritters and Crawfish Boullettes as well as some delicious entree dishes like omelettes and shrimp and grits. It’s BYOB, so be sure to stop on your way if you want a cocktail during brunch. The Scoop: Get an iconic French Quarter dining experience in this romantic, courtyard-clad restaurant. Seasonally inspired cocktails crafted with locally sourced ingredients pair perfectly with each of the brunch-time dishes at Café Amelie. 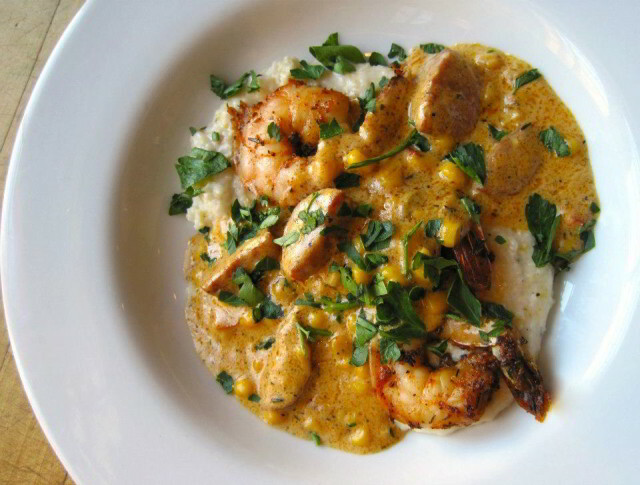 Their menu is full of great choices, but their beloved Shrimp & Grits, served with corn and andouille maque choux, is a winning bet. The Scoop: Brunch is served at this charming French Quarter restaurant on Friday, Saturday & Sunday from 10:30 a.m. – 2:30 p.m. Choose from classic brunch options like Brioche French Toast or shrimp & grits or opt for a specialty entree like the Pork Shoulder Benedict, a southern spin on the traditional dish, and the “Chick-Syl-vain” Biscuit, a buttermilk-fried chicken breast served with cheddar, bacon, and grits. Be sure to pair your order with a refreshing Bloody Mary, crafted from freshly-made tomato juice. The Scoop: Brunch at Meauxbar is served from 10:30 a.m. – 2:00 p.m. every Sunday and features small and large plates that make for a perfectly sharable meal. Fill your table with mouthwatering options like deviled eggs, crepes, grilled pork belly and chicken confit hash, or partake in their Brunch Tasting Plate, a smorgasbord that changes daily to highlight the best seasonal and local ingredients. Be sure to spring for the Unlimited Mimosa Set Up as well, complete with local citrus, bitters, & tinctures that you can flavor to taste. Crabmeat cheesecake, the crown jewel of Palace Café’s brunch menu. The Scoop: Housed in the historic Werlein’s music building on Canal Street, Palace Café is part of the famous New Orleans restaurant family spearheaded by Dickie Brennan. If you go, you can’t pass up their signature dish, the Crabmeat Cheesecake. 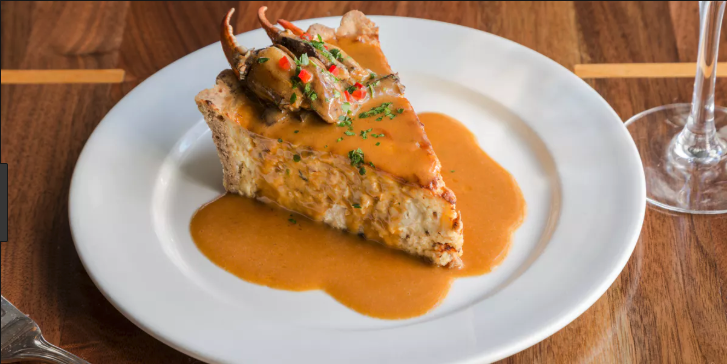 Don’t let the name fool you – this dish features a savory blend of fresh crabmeat, pecan crust, mushroom sauté, and Creole meuniere. The Scoop: Looking for a picturesque brunch date? Set the scene in the casual, mid-century modern dining room at Salon by Sucré. This French-inspired hotspot offers brunch Thursday through Monday from 11:00 a.m. to 3:00 p.m. Highlights of the menu include a hearty Frittata, Chicken Poutine, and the B.O.L.T., a uniquely NOLA take on the classic B.L.T. with fresh, fried oysters for some Gulf flavor. Ready for Your Afternoon Nap? If all these incredible brunch spots have worked up your appetite, be sure to book your stay at Bienville House Hotel – that way you can experience all the best dining spots just minutes away. 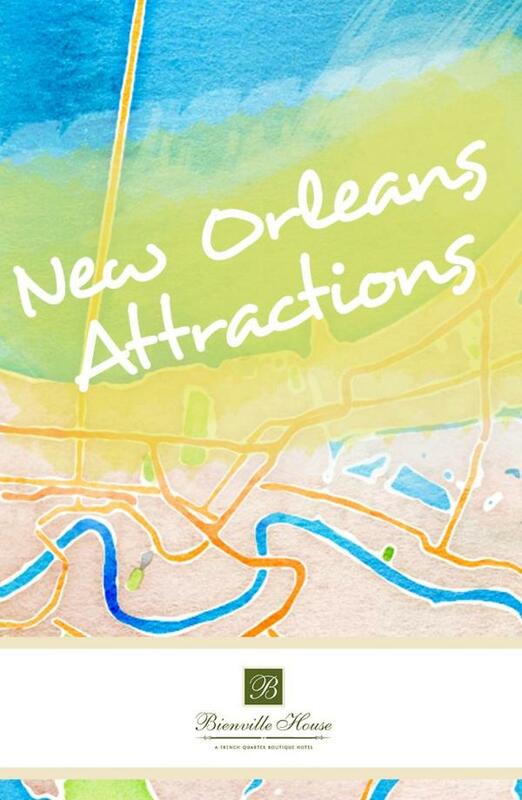 Come get a taste of New Orleans in the heart of the French Quarter today!